The way a body moves is a result of posture, mental state, openness to suggestion, and whether or not there is pain or injury in the body. If there is pain or injury, it makes sense to heal that first. The opposite is also true. In order for the body to heal, we must heal the movement pattern. We must create a dynamic of harmony and freedom in the whole body and mind. For example: A massage can decrease the tension in your neck, but if you are stressed at your job and hunch over your computer for hours, that stiff neck will keep coming back. A horse with a tight back that is caused by crookedness, or poor riding is going to be more prone to suspensory injury, excessive front-end loading, and hock and back pain. When the body is tight there is less shock-absorption and when one part of the body is tight, another usually has to work harder. Once there is some pain, the body protects itself even more, the mind becomes resistant, stops trusting, and this cycle of brace continues. Many owners are told to keep injecting those joints, put pads on his shoes, and 'protect' their horse more and more by restricting his movement. That strategy is missing a very important piece of the puzzle! What does it mean to change the movement pattern? Ease areas of unnecessary tension by bringing the horse’s awareness to it and giving him an opportunity to release it. I call this Moving Massage. Doing this in motion gives clear and immediate biofeedback to the horse. Create an openness to suggestion and decrease the braces of opposition. This comes from building trust of aids, clear communication, nurturing curiosity, and encouraging participation from the horse. Explore, observe, and listen. I put aside my knowledge for a moment and instead search with curiosity for a place where the horse tells me he feels the most balanced and free. I call this the Basic Alignment Exercise. Leave him alone to enjoy his movement. I need to make sure I allow him to feel it on his own. This is the place I call the Sweet Spot of Healthy Biomechanics. Horses learn to seek this. There is an unmistakable feeling when a horse starts to move with more harmony within himself. When there is ease in the body, then there is more power and less strain, and the whole horse can stay healthier as whatever actual injury is healing. If the injury you have been treating was caused by the way he moves, healing the movement will heal the whole horse. What to do first: Body healing or movement healing? First be sure the horse doesn’t have an injury where movement is truly contraindicated (broken bones, ligament tears, etc). If he is clear of that, then I want to improve the movement pattern in a way appropriate for him. Once there is some positive change of pattern, then I support with bodywork if needed. 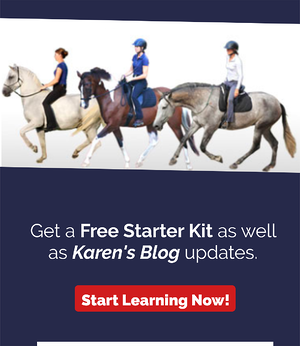 The goal is to help it be even easier for the horse to improve his movement pattern. The treatments will ‘go in’ better and will last longer. Body work I use regularly on my horses (and myself) are craniosacral/myofascial work, acupuncture, and photonic therapy. When horses learn to be more open and free in their bodies they move better, and become more self-aware and more open to training and treatments. All healing ultimately comes from within. I prefer to treat my horses in a way that allows them to participate and experiment with their possibilities instead of only choosing between obliging them to do what is asked, or putting them on stall rest when they can’t. If your horse has soreness or chronically needs bodywork, ask yourself: I wonder if there was a way he could move with more freedom, balance, and harmony?